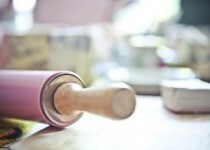 The best way to get the guests to relax and interact with each other is to provide an activity like a craft class. I have two easy to do options that will suit any age or level of experience. And for those guests who think the last thing they are is artistic, I will surprise them with just how creative they can be. 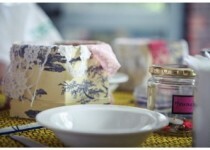 All materials are provided for the craft class and are included in the cost per person. 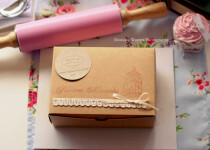 Why not keep the craft class a mystery and surprise the guests with it during the kitchen tea or bridal or baby shower? The class lasts about 45-60 minutes so there is plenty of time to do other things like play games and open gifts. After going through the descriptions below, once you have made your decision on which is the right craft class for you, fill out the form at the bottom of the page and let me know! Using a special type of clay, I teach the guests how to use lace, cutters and stamps to make beautiful decorative shapes. It can be used as gift tags, made into a mobile, hung up around the house or in a window. The project is such fun and so simple, absolutely anyone can do it. 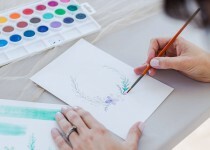 Each guest receives a beautiful, hand-drawn template of a flower wreath which they can paint with watercolours. I have little trays of solid watercolours. They are easily used by wetting your brush and mixing the water into the paint block. 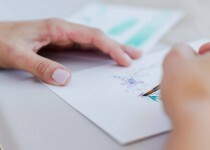 A practice sheet is provided for the guests to get comfortable. This will help them to get used to working with the paint and using a brush to create certain strokes. Even if you’ve never held a paintbrush before, you will be able to complete this project. I will be there to guide the guests through each step and help them if they need. Please note that the venue you choose to have your craft class at would have to have given authorization. If I book the venue, I will get authorization, if you book the venue it will be your responsibilty. Most venues do not mind, but some venues do. 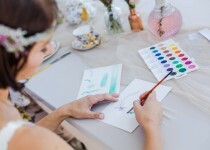 If a venue is unaware that we are hosting a craft class upon arrival, we have the right to withdraw/withhold the craft class until we have been given permission by the venue. You are welcome (encouraged, really) to take your project home, but please leave all the craft class equipment behind so that we can continue bringing some fun and entertainment to future clients. We kindly request that the craft class be the first order of business on the day of your event. Once everyone arrived and before the party really starts, this is the best time to get crafty, since we will have all the ladies seated, present, inspired and excited. Kindly complete the following information so I can prepare the materials for your craft class (only complete this section if you have booked and secured your date with me).